Sometimes, my job at the Daily Inter Lake is a lot of fun. For Halloween this year, the entertainment editor asked the reporters to do stories about monsters. I don’t normally write, my job is photos. But as I thought about the section and what it would need I thought it could be a lot of fun to write about bridezilla. The story I didn’t have very clearly in my mind, but the photo…I knew exactly what I wanted. And it came together better than I could have dreamed! The above is the shot that ran. Here is the story. And below you find more photos of the women looking like the truly beautiful creatures they are. 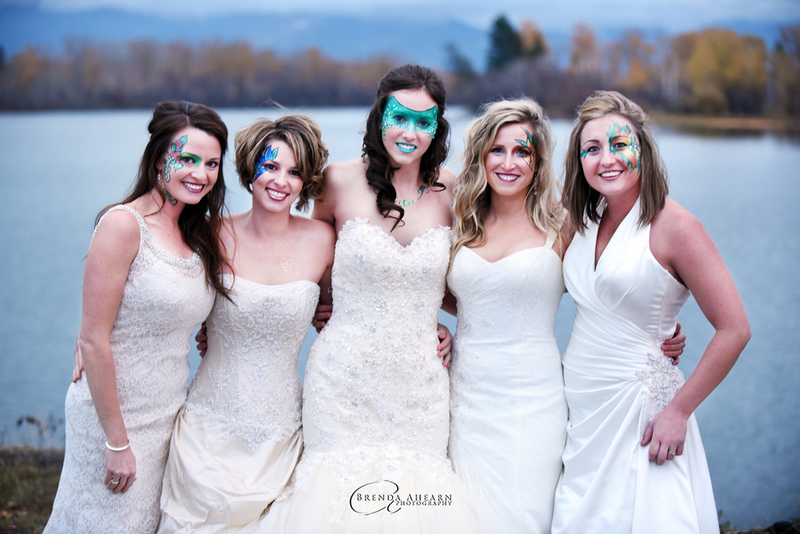 The irony is, two of these are brides I photographed. I know, cause I was there, that they weren’t bridezilla. And the other three are good friends. None of these could ever be bridezilla. I think that’s what I loved best about this photo shoot. These girls all agreed to this when the truth is they are as far from the monster as anyone ever could be. Oh, Bridezilla. In all my time working as a photographer in Montana, I have never personally encountered this infamous monster. But the stories are the stuff of legend. This is a strange creature, usually only appearing once per lifetime. TV shows have been made about her. Books and articles have been written how not to become her. Grooms everywhere shudder at the mention of her name. Bridezilla. Like the Dr. Jekyll and Mr. Hyde of weddings, as the big day gets closer, the more dangerous it becomes for everyone around her. Normally sane, rational, lovely women are taken over and transformed into the very likeness of the hideous monster! They shout, cry demand. Nothing is good enough. Nothing satisfies. No amount of perfection can sooth them. The self-induced stress, creates angry, volatile, unpredictable and moody monsters. Some of you scoff and doubt. But I am a believer. I photograph a lot of weddings. And thus far I have been extremely blessed with the brides I’ve gotten to to photograph (including two of the lovely ladies pictured here). But statistics don’t lie. It’s only a matter of time before I will come face to face with the creature. Maybe you will too. Bridezilla is real. It’s a goofy story, and for me, the photo was far more important. I wanted something very specific for this image. Elegance. 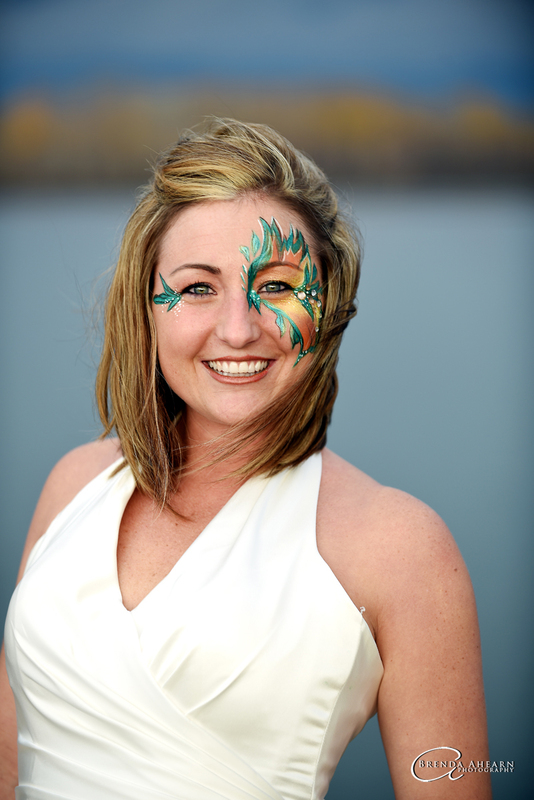 I contacted Kathleen Francis of Fancy Face Design because I love her work. She can create some of the most gorgeous face paintings I’ve ever seen. 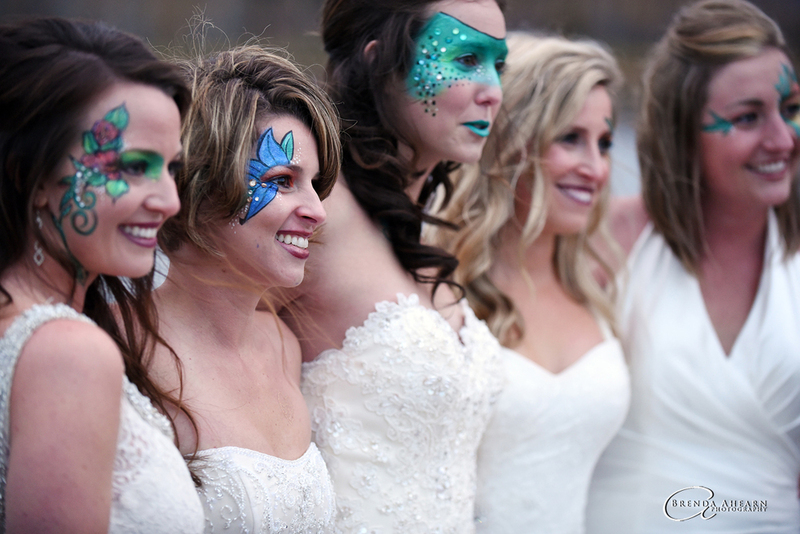 In reality the number of people who might be up for this kind of make-up on their wedding day is going to be minimal. I explained things to Kathleen I didn’t want her to create Halloween-type monster faces, but rather, I wanted super glamorous make-up. 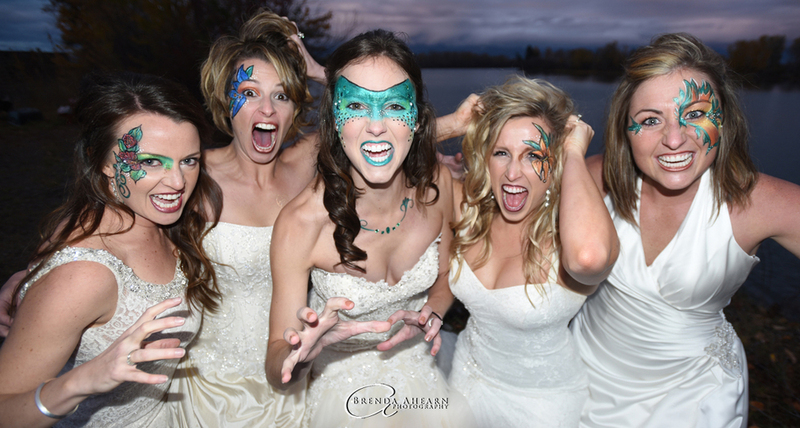 I wanted the only “monstrous” aspect of this photo to be the expressions on the bride’s faces. So when the bridezilla shot was done I suddenly had 5 super glammed up girls in gorgeous dress…why wouldn’t we take more portraits? 🙂 The rest of the photos from the night are below. The only disappointment of the night was how fast the light faded. We had an overcast sky and it got dark rapidly. 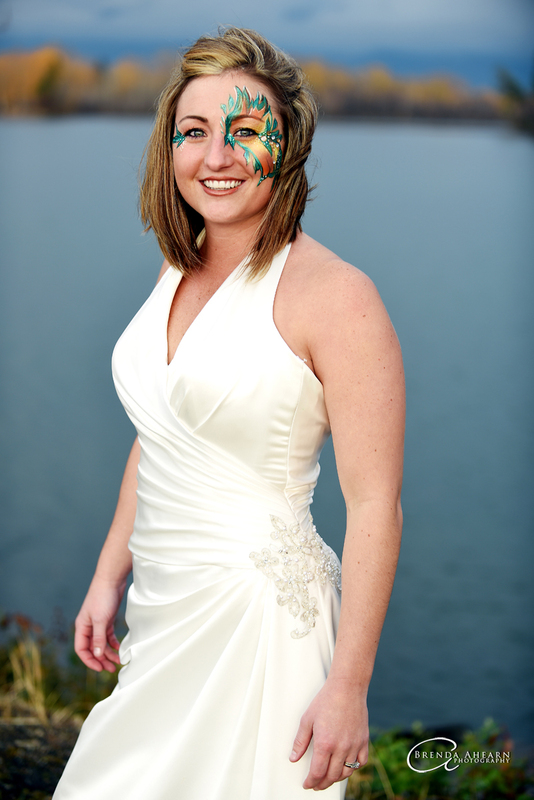 I’ve been a photographer for 20 years and I can’t even guess how many brides I’ve photographed in that time. I have to say, honestly, this was one of the most fun photo shoots I’ve ever done. Bren – you always do such a FAB! article! This is no exception!!! I can not believe it is already 20 YEARS since you became such a fantastic photo/journalist!!! Continue to do such great work – I always thoroughly enjoy & learn from everything you do! We are all so proud of & for you!!! Thanks Joshi, these ladies were so much fun!